After an extensive redesign for the 2017 model year, you won't see a whole lot of changes between the current model year and its immediate predecessor. However, when you compare the 2018 CR-V to the previous generation, you'll discover glaring differences. Namely, the modern CR-V is sleeker and more family-friendly. Inside, you'll find increased rear legroom, so your kids will climb in the backseat more willingly. This five-passenger crossover SUV is also faster and more efficient than previous models, thanks to its new turbocharged engine. 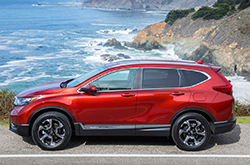 During the redesign, Honda also returned the CR-V's suspension to reduce body roll around turns, giving you greater composure as you travel down winding roads and narrow city streets. No matter your budget, there's a CR-V for you. 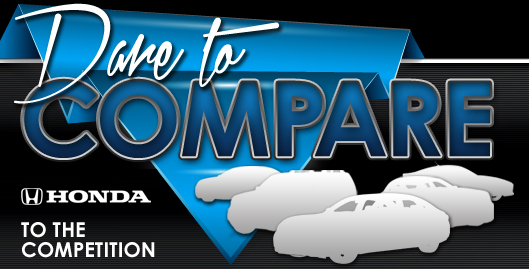 Choose from four trim models: the base LX, mid-grade EX, luxurious EX-L, and fully loaded Touring. The entry-level LX will save you the most money upfront, but it never shorts you on comfort or convenience. 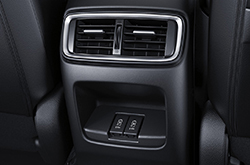 Inside, you'll find a roomy cabin and automatic climate control for a family-friendly highway experience. Bluetooth connectivity gives you the ability to stream audio from devices, including podcasts and your favorite Pandora stations. Upgrade to the EX for a more modern ride, with heated seats and heated mirrors to help you get through a cold morning drive. The EX also includes an infotainment upgrade, with a 7-inch central touchscreen and Apple CarPlay/Android Auto technology. The latter displays smartphone apps - including your phone's Maps app - on the central touchscreen, minimizing on-road distractions. The EX-L is the right choice for luxury-minded CR-V drivers. With leather upholstery and a leather-wrapped shift knob, you'll feel like you're cruising in an expensive European luxury crossover. Finally, there's the Touring model. It adds to the EX-L's air of luxury with a touch of style, including dual chrome exhaust tips and ambient interior lighting. 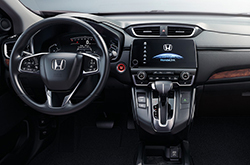 The infotainment system includes navigation functions, helping you travel deep into unfamiliar territory. Choose between two street-smart CR-V powertrains. On the entry-level LX model, you'll find a 2.4-liter four-cylinder engine that produces 184 horsepower and 180 pound-feet of torque. This powertrain is quick to respond to your input, giving you a peppy ride around town. It also earns up to 26 city/32 highway mpg, so you can keep your fuel budget within the realm of reason. If you want greater power, however, you should check out the CR-V EX and up. These models come with a more powerful engine, a turbocharged 1.5-liter four-cylinder. It increases speed with 190 horses and 179 pound-feet of torque. Moreover, this engine also improves fuel economy. With front-wheel drive, it earns 28/34 mpg. Both powertrains can be equipped with all-wheel drive, maximizing traction as you travel through off-road trails and over icy roads. As usual, Honda puts safety first. According to the National Highway Traffic Safety Administration, the CR-V came away with pristine crash-test scores, earning a perfect five stars for overall protection. The Insurance Institute for Highway Safety was also impressed, naming the CR-V a 2018 Top Safety Pick. You can also choose from a wide range of driver safety aids to help maximize your on-road vigilance. These include the forward collision mitigation system, technology that both detects an oncoming crash and helps you avoid it by automatically applying the brakes. The lane departure warning and intervention system actively keep you in the proper lane, gently guiding you back on the right track when you stray outside the lines. Blind-spot monitoring alerts you to vehicles you might not be able to see, so you won't sideswipe anyone when you switch lanes.